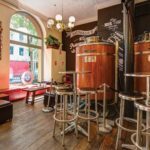 [/col] [col size=”6″ class=”island”] Redoak is a local restaurant, bar and brewery in Sydney which also happens to be Australia’s most awarded brewery. It offers the best beer & food experience in town. A must try is a meat or seafood Tasting Board – a beer and food paired to perfection. Drink local real craft beer, grab a mouthwatering burger, delicious pizza, quick lunch, relaxed dinner or indulge in dessert. There’s seriously something for everyone with great beer, food and service. We cater for events | parties | functions and more and are happy to answer any questions you have. Phone or email an event enquiry and check us out. Did you know? Redoak was established in Sydney 2004 by brother and sister duo (David & Janet) and is an Australian owned, small, independent brewery. Our brewery uses 100% solar energy and works closely with local farmers. Our chefs also support Australian farmers and producers sourcing Australian native herbs and spices, fresh local produce, sustainably farmed fish, local wines, wherever possible. Visit us at 201 Clarence Street, Sydney CBD, opposite Baxters, to experience and taste the difference for yourself.